George Dellar & President's Cup Competition with judge Sarah Kelman. A talk titled "A Tour of Prague" by Wes Gibbon. A talk titled "Wonderful Wetlands & Rivers" by Chris Ward. Monthly Competition 4 (Jan) with Judge Kenneth Payne. A talk titled "Judge for Yourself" by Richard Cobby. 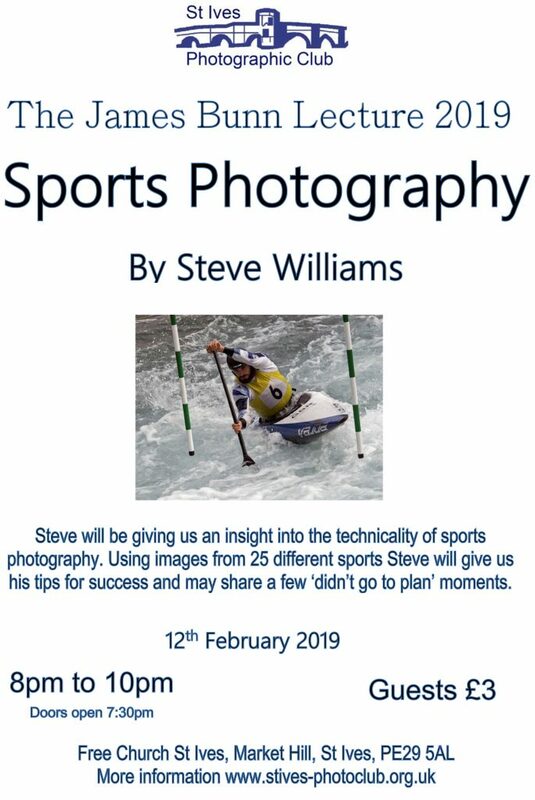 A talk on Sports Photography by Steve Williams. Critique Evening with Adrian Stone. Monthly Competition 5 (Feb) with judge Peter Going. 1. Hayley is bringing her dog Kika and she is a Border Terrier. Photography using Anne's lights. 2. Light Cube Close ups of objects using small LED lighting. 3. High Key Background for portraits using SIPC LED lights. 4. Musical Instruments using the library background and LED diffusers. Monthly Competition 6 (Mar) with judge Ben Pike. Unfortunately the Church is closed due to work on the Church so this weeks meeting is cancelled. Howver, why not join us for a drink and a chat at the Golden Lion St Ives. Annual Print and Monochrome Competition with judge Naomi Saul.